"Her approach highlights the earthy vitality of the stories depicted..."
In this new Lyrichord recording, 21st century understanding of 17th century performance practice meets the formidable virtuosity of Biber’s violin writing. With the most extensive use of scordatura (re-tuning) in violin repertoire, each piece is given its own sound-world. 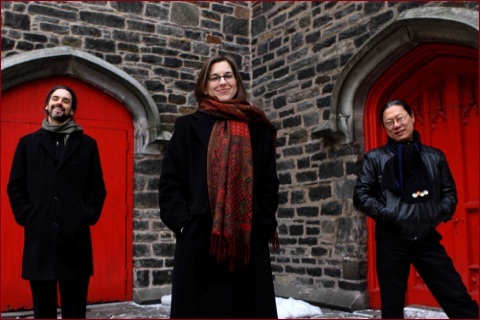 Using a facsimile of the only surviving manuscript, gut strings, short bows, theorbo and chamber organ, these highly regarded period players offer a historical and impassioned approach to these improvisatory preludes, hymn-like sonatas, and spirited dance movements honoring the Mysteries of the Rosary. Listeners are moved by the power of this music, carrying us through joy, sorrow, and glory, reflecting scenes of life, death, and rebirth. “...my four-stringed lyre, re-tuned in 15 different ways..."
In these unique and demanding works of early virtuosic violin writing, the player is urged to coax a variety of unusual sounds and effects from the instrument. In scordatura, the virtuosity is heightened as the violin strings are tightened or relaxed, harmonies and resonances are opened or restricted, tensions rise and fall, enhancing the distinctive character of each evocative piece. Inspired by the Mysteries of the Rosary, 17th century Bohemian-born H.I.F. Biber put quill to paper to create this exquisite collection that moves the soul and connects the spiritual with the temporal. Regardless of one’s faith, the listener cannot help but be moved by the power of these pieces. "...like a diamond in a velvet case." "...an elegant and beautiful recording." "The double-stops in The Annunciation are played with a delicate sweetness and accuracy that is most welcome—"
"Nelson meets all of the technical demands of the violin part with ease and sensitivity." "Leah Gale Nelson brings fire and fervour to this very fine, historically-informed recording of the Biber Rosary sonatas." "The ensemble in this recording performs in a historically-informed style, using Baroque pitch (A = 415) and quarter- comma meantone temperament. In keeping with this approach Leah Gale Nelson uses little vibrato, using varying bow pressure to shape the phrases. The open strings are tangy, giving a slashing character to the repeated chordal writing. The first sonata sets the tone of rather theatrical fervour that recurs throughout the cycle." "Biber's daunting technical demands sound effortless in her confident, shapely playing." "Leah Gale Nelson delivers a robust, securely grounded performance of the sonatas, playing with a clean but vibrant tone. Her approach highlights the earthy vitality of the stories depicted in the music rather than an airy ethereality, and the effect is bracing. 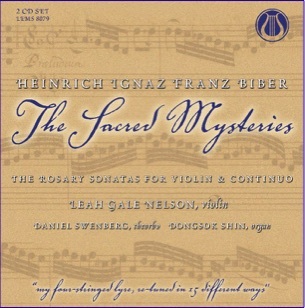 She brings plenty of nuance to each of the pieces and persuasively heightens the intense emotionality of the religious devotion that the movements are intended to inspire..."
"In this new recording of the Sacred Mysteries, violinist Leah Gale Nelson deftly meets its challenges and delivers a performance that constantly engages the listener." "Her interpretation underscores the passion and religious focus etched in the music." "Opting to keep the continuo section lean, Nelson is well supported by Daniel Swenberg on theorbo and Dongsok Shin on organ. 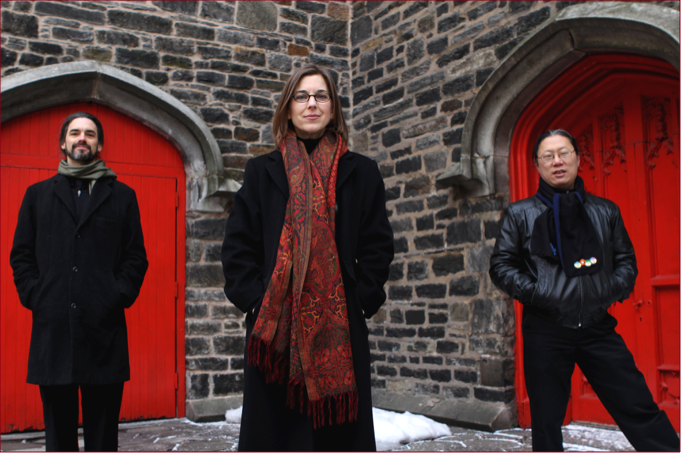 Swenberg and Shin are terrific collaborators, and their sensitive and cohesive realization provides the flexibility for Nelson to fluidly shape her lines." ©Copyright 2013 - Leah Gale Nelson. All rights reserved. Daniel Swenberg specializes in historical plucked strings: Renaissance and Baroque lutes, theorbos, baroque and 19th-century guitars, and baroque mandolino. He performs regularly throughout North America and internationally with ensembles including ARTEK, REBEL, The Metropolitan Opera, Mr. Jones & the Engines of Destruction, Ensemble Viscera, New York City Opera, Opera Atelier/Tafelmusik, Catacoustic Ensemble, Orchestra of St Luke’s, Apollo’s Fire, with soprano Nell Snaidas, and with Lizzy & the Theorboys. He has accompanied Renee Fleming and Kathleen Battle at Carnegie Hall. Daniel received awards from the Belgian American Educational Foundation (2000) for a study of 18th century chamber music for the lute, and a Fulbright Scholarship (1997) to study in Bremen, Germany at the Hochschule für Künste. He studied previously with Patrick O’Brien at Mannes College of Music, receiving a Master’s degree in Historical Performance (Lute). Dongsok Shin was born in Boston and played the piano from the age of four. Since the early 1980s he has specialized exclusively in early keyboard instruments. Much in demand as a soloist and continuo player, Mr. Shin has performed with ARTEK, Concert Royal, Early Music New York, Carmel Bach Festival, Clarion Music Society, Mark Morris Dance Group, New York Collegium, New York Philharmonic, Orchestra of St. Luke’s, and Orpheus Chamber Orchestra. He has toured throughout North America, Europe, and Mexico, has been heard on numerous radio broadcasts, and has recorded for Lyrichord, Newport Classic, Helicon, ATMA Classique, Hänssler Classic, Dorian Recordings, and Bridge Records. A member of the internationally renowned baroque ensemble REBEL since 1997, Mr. Shin was a founding member of the Mannes Camerata, receiving critical acclaim as music director for their productions of early-Baroque operas. He has been guest director as well as a member of NYS Baroque in Ithaca, NY. In his spare time, he tunes and maintains harpsichords in the New York area (he is the harpsichord technician for the Metropolitan Opera), and is known as a recording engineer, producer, and editor of numerous early music recordings.